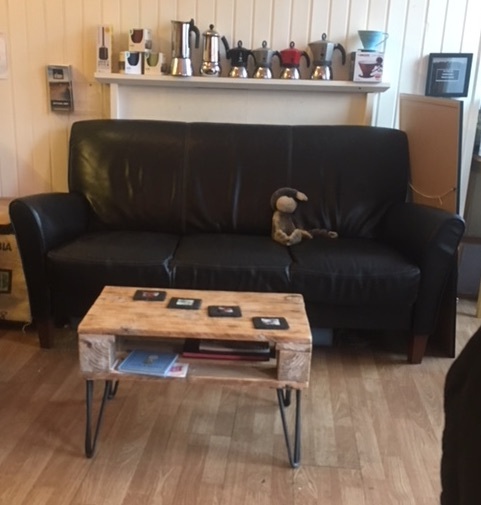 Hear no evil, see no evil, speak no evil, so the saying goes and so the monkey, that was sitting on the sofa at the Inverness Coffee Roasting company (and café) indicated. And while I would not like anything evil to be said on this website generally, today it will be taken to an extreme as this cafe-physics review will not say much at all. Not because the coffee was not good, my Americano was a lovely complex dark and very enjoyable brew. Nor because there weren’t things to write about, several avenues suggested themselves for a ‘cafe-physics’ type review. There were also plenty of things to enjoy nibbling on while sitting down in this warm and comfy environment taking in the surroundings. Chocolate from The Chocolate Place was clearly labelled (and so I could enjoy it confident that it was nut-free) with a good variety of interestingly flavoured chocolates. The chocolate/coffee combination always goes well and the salted dark chocolate indeed complemented the coffee. A variety of freshly roasted coffees were in jars ready for selling to the home-brewing crowd and I heard both people behind the counter discussing coffee tastes with different customers to ensure that they could properly recommend a coffee for each of them. 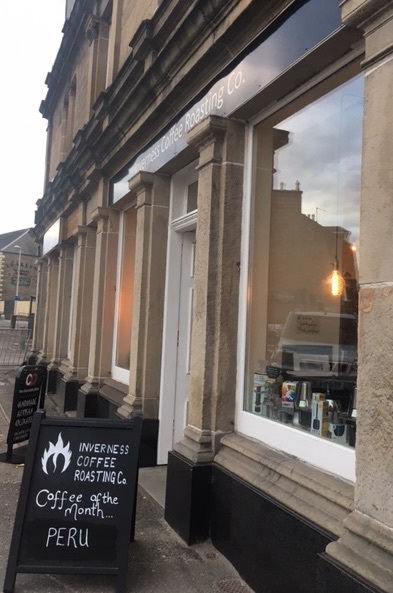 So why, if the coffee was good, the service friendly and the environment interesting am I not going to write much about Inverness Coffee Roasting Company? Well, largely because I had been on holiday and so the preoccupations of the days before would necessarily influence what I noticed about this little café. Although I could happily write about neolithic monuments and considerations about inter-generational solidarity in relation to the re-use of refuse heaps at Skara Brae (as building material) and our own use (or misuse) of refuse in our environmental behaviour today. And it could even fit into a cafe-physics review of this venue as a sign on the wall above the door invited everyone to join the Plastic Free Scotland movement. However, it is not really what a Bean Thinking cafe-physics review is about. The idea behind the cafe-physics reviews is that things are often connected in surprising and beautiful ways and we can generally only see the connections if we slow down and look for them. Monkey on a sofa, but there was much more to notice at the Inverness Coffee Roasting Company if you looked around you. Therefore, while you may (or may not) prefer to read about my holiday considerations of all things thousands of years old, what I thought I’d do with this café review is suggest a few things that I noticed in the café, things that offered a variety of potential thought-trains and then see what you think, what you notice, what you see (or don’t see). Perhaps you will observe something in one of the photos that clicks into a thought train for you, perhaps you can look around you, wherever you are right now – and think about the connections you could make to things you sense there instead? But whichever you do, it is a great time to sit back with a coffee (or perhaps a tea), breathe in and take in your surroundings. Back in Inverness, the first thing of course was the monkey. Eyes shielded with an arm, suggestive of those who would prefer not to see what is in front of them. Nancy MacLean in “Democracy in Chains” notes that a training in the humanities perhaps opens students to question their society more than other, more utilitarian, subjects may do. Is it hurt pride that makes me rebel against this idea? Can’t physicists question too? Perhaps it is connected but a sign by the door, and an identical one by the sofa, was written on the glass front of a box of coffee beans: “in emergency break glass”. This suggested so many avenues for exploration to me, I wonder which occur to others? Behind our seats, a lizard was painted on/engraved into a stone, suggestive of fossils, geology and how we collect evidence. But a second lizard suggested a different direction. An ornamental lizard was positioned as if climbing up the counter. How do lizards climb? What is it about their feat? What connects lizards to a coffee company? 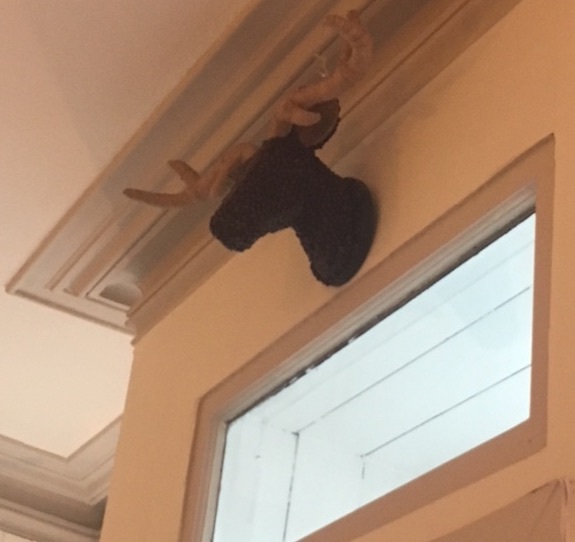 Above our heads and above the door, stereotypical of Scotland perhaps, loomed a deer head complete with antlers. But this one was different: it was made of coffee beans and string. How a bean based diet could replace a meat one? The nature of units and how it would not necessarily be sensible to measure the mass of a deer in units of coffee beans? The mind jumped. Jumping beans? Gruesome ornament or vegan friendly? Finally, the logo of the cafe which was featured on signs around the interior and exterior of the space: a flaming coffee bean. The Maillard process and the changes in coffee as it is roasted? The nature of heat/temperature and the manner in which we measure it? What we hear as fire burns, lightning bangs or on “the first crack” of roasting and what this tells us about our atmosphere, our planet and our coffee is made of? Whatever you notice, please get in touch, either by Facebook, Twitter, leave a comment or send me an email. But one last thing on coffee thought trains that links to real trains and is perhaps reflective back onto what it means to pause and watch. We left Inverness the day after our visit to Inverness Coffee Roasting by train. Inverness station has a relatively steep (1:60) gradient for 20 miles on leaving the station. It is Scotland in autumn, it had been raining and leaves had been falling on the line. Five or ten minutes out of the station, our train to Kings Cross juddered and came to a halt. A signal failure apparently. As the driver re-started the train, it slipped backwards, and again. We weren’t able to get up the hill. And so we had to return into Inverness station. Once back at Inverness station, the guard came across the tannoy and suggested that the signallers had given us the go-ahead to ‘have another run’ at the hill to see if we could get up it this time. So we tried again, juddering and shaking to a stop a few hundred metres beyond where we had stopped before. Back to Inverness station it was. The ever hopeful guard came across the tannoy again: “Third time lucky, fingers crossed”. This time the train left the station faster, building up speed, moving along more quickly and powering out of the station. The carriage was silent, were we going to make it? Past the first point we stopped at, past the second, a bit further, the family behind clapped, the train continued then slowed down and shook, juddered and then sped up again. We were over the hill and on our way back to London. A last consideration on the conservation of energy and its relation to coffee and thought trains? Or a metaphor for how we may not find those connections in that cafe come to us quickly but if we persist and keep noticing, we can go on a fascinating journey?